INFLATION may have ruined “How to marry a millionaire” as a good film title, but there is still something magical about $1m. How long would it take for an average person to earn that special sum? 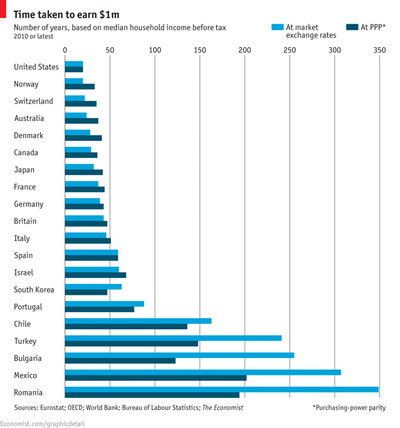 To find out The Economist looked at how much the main breadwinner in an average household makes each year (before tax). On this measure, America creates the swiftest millionaires, and also the most (around 5m households, or 4% of the total). South of the border, Mexicans can expect to toil for three centuries to earn the same. For those struggling to imagine $1m, consider this: stacked up and denominated in $100 notes, it would reach over a metre high and weigh 10 kilograms (22 lb).